The passage from private life to public life … is always of necessity a passage from a greater work to a smaller one, and from a harder work to an easier one. And that is why most of the moderns do wish to pass from the great domestic task to the smaller and easier commercial one. They would rather provide the liveries of a hundred footmen than be bothered with the love-affairs of one. They would rather take the salutes of a hundred soldiers than try to save the soul of one. They would rather serve out income-tax papers or telegraph forms to a hundred men than meals, conversation, and moral support to one. They would rather arrange the educational course in history or geography, or correct the examination papers in algebra or trigonometry, for a hundred childrcn, than struggle with the whole human character of one. For anyone who makes himself responsible for one small baby, as a whole, will soon find that he is wrestling with gigantic angels and demons. In another way there is something of illusion, or of irresponsibility, about the purely public function, especially in the case of public education. The educationist generally deals with only one section of the pupil’s mind. But he always deals with only one section of the pupils life. The parent has to deal, not only with the whole of the child’s character, but also with the whole of the child’s career. The teacher sows the seed, but the parent reaps as well as sows. The school-master sees more children, but it is not clear that he sees more childhood; certainly he sees less youth and no maturity. The number of little girls who take prussic acid is necessarily small. The boys who hang themselves on bed-posts, after a life of crime, are generally the minority. But the parent has to envisage the whole life of the individual, and not merely the school life of the scholar. …Everybody knows that teachers have a harassing and often heroic task, but it is not unfair to them to remember that in this sense they have an exceptionally happy task. The cynic would say that the teacher is happy in never seeing the results of his own teaching. I prefer to confine myself to saying that he has not the extra worry of having to estimate it from the other end. The teacher is seldom in at the death. To take a milder theatrical metaphor, he is seldom there on the night. But this is only one of many instances of the same truth: that what is called public life is not larger than private life, but smaller. What we call public life is a fragmentary affair of sections and seasons and impressions; it is only in private life that dwells the fullness of our life bodily. out an eighth‐floor window on 62nd street. I’m trying to teach math in the building across the street. Who can teach when there are such lessons to be learned? or come through everything, even air. which, of course, it is. The most neglected reality in education is the reality of the present moment, of what is happening here and now in the classroom itself. To speak of the classroom as a place “in which obedience to truth is practied” is to break the barriers between the classroom and the world–past, present, and future. To speak this way is to affirm that what happens in the classroom is happening in the world; the way we related to each other and our subject relfects and shapes the way we conduct our relationships in the world. By this definition of teaching, we practie troth between knowers and the known in the classroom itself. The class is understood as part of the community of truth–more intense and reflective perhaps than other parts of that community, but related to all the rest. Reality is no longer “out there” but between us; we bridge the gap between learning and living by attending to the living reality of the learning situation. From chapter 6 of Parker J. Palmer’s To Know as we are Know (88-89). To teach is to create a space in which obedience to truth is practiced. …A learning space has three major characteristics, three essential dimensions: openness, boundaries, and an air of hospitality. …Openness is no more than the commonsense meaning of space. To create space is to remove the impediments to learning that we find around and within us…. So creating a learning space means resisting our own tendency to clutter up our consciousness and our classrooms. One source of that tendency is our fear of appearing ignorant to others or to ourselves. Even though we are bright into education by ignorance, the fear of “not knowing” often leads us to pack the learning space with projections and pretensions. Teachers lecture longest when they are least sure of what they are doing. …If we can affirm the search for truth as a continual uncertain journey, we may find the courage to keep the space open rather than packing it with pretense. Second, we must remember that we not only seek truth but that truth seeks us as well. When we become obsessed with our own seeking, we fill the space with methods and hypotheses and reports that may be mere diversions. But when we understand that truth is constantly seeking us, we have reason to open a space in which truth might find us out. The openness of a space is created by the firmness of its boundaries. A learning space cannot go on forever; if it did, it would not be a structure for learning but an invitation to confusion and chaos. A spaces edges, perimeters, limits. … The teacher who wants to create an open learning space must define and defend its boundaries with care. Not only will this keep the space open, it will also keep the students from fleeing that space. The openness of space–which is at first appealing to our jangled minds–soon becomes a threat. As the clutter falls away we realize how much we depend on clutter to keep our minds employed, to make them feel masterful. We do not want to face the barrenness that comes when our mind-made structures fail, so we run toward some distraction. If you doubt this, try creating a long silence in your classroom as Abba Felix did in his. Feel the anxieties arise in you and your students alike. …The desert teachers know thees anxieties well. They know that in the desert, before we encounter truth, we must first wrestle with the demons of untruth that arise in the silence, demons that come from our own need to manipulate and master truth rather than let truth transform us. …So the desert teachers disciplined themselves to stand their ground, to stay within the boundaries of the learning space so that truth might seek them out. One symbol of this discipline was the “cell” (often a hut or cave) in which these teachers lived. …Good teachers know that discomfort and pain are often signs that truth is struggling to be born among us. Such teachers will not allow their student, or themselves, to flee from the “cell.” They will hold the boundaries firm, and hold us all within them, so that truth can do its work. But precisely because a learning space can be a painful place, it must have one other characteristic–hospitality. …So the classroom where truth is central will be a place where every stranger and every strange utterance is met with welcome. This may suggest a classroom lacking essential rigor, a place in which questions of true and false, right and wrong, are subordinated to making sure that everyone “has a nice day.” But that would be a false understanding of hospitality. Hospitality is not an end in it self. It is offered for the sake of what it can allow, permit, encourage, and yield. A learning space needs to be hospitable not to make learning painless, but to make the painful things possible, things without which no learning can occur–things like exposing ignorance, testing tentative hypothesis, challenging false or partial information, and mutual criticism of thought. Each of these is essential to obedience to truth. But non of them can happen in an atmosphere where people feel threatened and judged. …I have been in some classrooms where people seemed to be pressing each other, asking hard questions, stripping off the veils of falsehood and illusion. But behind the appearances, something else was often going on. In an inhospitable classroom, many questions do not come out of honest not knowing. They are rhetorical or political questions designed to score points with the teacher or against other students, questions asked not for truth’s sake but for the sake of winning. In such a setting it is nearly impossible to reveal genuine ignorance–which means that genuine openness to learning is nearly impossible as well. To Know as We are Known by Parker J. Palmer on pages 69 to 75 (from chapter 5, “To Teach is to Create a Space…”). The inability of the present generation of young people to read, write, and think is only a symptom of our departure from dialectical learning, but it is everywhere being treated as the disease itself. So long as these skills are valued only for utilitarian ends, such as those delineated by Mao, they must fail to excite in our youth the efforts necessary for their mastery. Not until we once again recognize and articulate the transcendent value of sound thinking, wide reading, and lucid writing will our students respond to their lessons enthusiastically. …The pedagogical avoidance of dialectic and dogma and of whatever touches man in his individual and religious domains forfeits the possibility for a truly classical education. Whereas Socrates’ dialectic embraced the whole and encouraged a struggle between the normative and utilitarian and between the dialectical and the analytical, modern ideology declares the struggle ended by peremptorily deciding the issue in favor of the utilitarian and analytical. From Norms and Nobility by David Hicks, pages 75-76. From Norms and Nobility by David Hicks. My wife found a delightful illustrator, Emily Winfield Martin, who has written a children’s book called Oddfellow’s Orphanage that we have been enjoying with our children. Chapter three, “A Day of Unusual Classes,” describes the following curriculum: F.T. Studies by Professor Flockheart (which stands for fairy tales OR folktales), M.O.N.S.T.E.R.S. by Professor Silas (which written out fully is “Mysterious Or Nonexistent Subjects Thoroughly Examined Really Scientifically”), lunch break, and Astronomy with Professor Stella (the last class of the day). 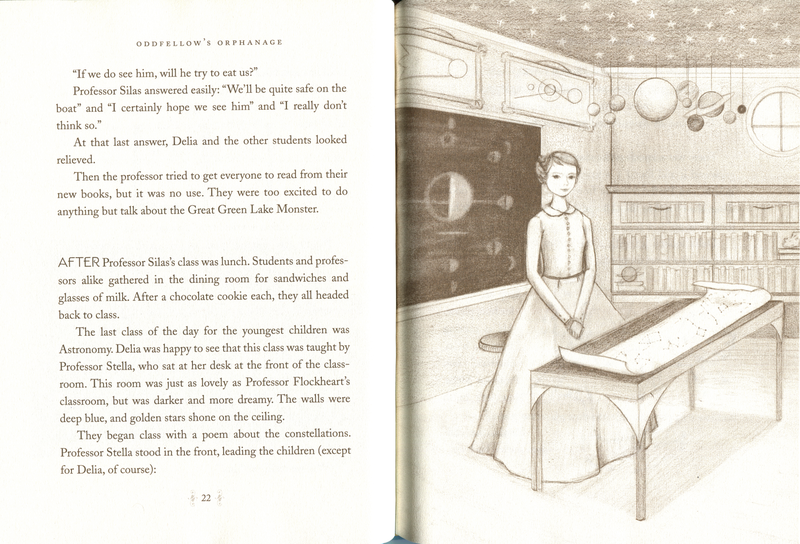 Here are sample pages, featuring an illustration of the Astronomy classroom (click on image for higher resolution). By starving the sensibility of our pupils, we only make them easier prey to the propagandist when he comes. His essay The Abolition of Man, published in 1944 and subtitled Or, Reflections on Education with Special Reference to the Teaching of English in the Upper Forms of Schools, would seem at first glance to have little to do with the grave matters with which I have begun. Not so. Lewis sees pernicious tendencies in, of all places, elementary textbooks. “…When Martin Luther King delivered his great speech, he cried, ‘I have a dream,’ not ‘I have a preference.’ How do you explain this? Is there a difference?” The somewhat flustered young man indicated that what King was calling a dream was at base just another preference, and so that was no different in principle from, say, debating marginal alterations in the price of commodities. This way of thinking makes hash of our moral sentiments, of our God-given capacity to reason about what is good, as Lewis asserts. This, surely, is what he feared in 1944: that something precious and irreparable was being lost. “The Abolition of Man: C.S. Lewis’s Prescience Concenring Things to Come” by Jean Bethke Elshtain in C. S. Lewis as Philosopher: Truth, Goodness and Beauty edited by Baggett et al (p. 87 to 90). I began to comprehend the obvious: that the central and shaping language of the church’s life has always been its prayer language. Out of that recognition a conviction grew: that my primary educational task as pastor was to teach people to pray. I did not abandon, and will not abandon, the task of teaching about the faith, teaching the content of the gospel, the historical backgrounds of biblical writings, the history of God’s people. I have no patience with and will not knowingly give comfort to obscurantist or anti-intellectual tendencies in the church. But there is an educational task entrusted to pastors that is very different from that assigned to professors. The educational approaches in all the schools I attended conspired to ignore the wisdom of the ancient spiritual leaders who trained people in the disciplines of attending to God, forming the inner life so that it was adequate to the reception of truth, not just the acquisition of facts. The more I worked with people at or near the centers of their lives where God and the human, faith and the absurd, love and indifference were tangled in daily traffic jams, the less it seemed that the way I had been going about teaching made much difference, and the more that teaching them to pray did. It is not easy to keep this conviction in focus, for the society in which I live sees education primarily as information retrieval. But there is help available. Most of mine came from making friends with some ancestors long dead. Gregory of Nyssa and Teresa of Avila got me started. I took these masters as my mentors. They expanded my concept of prayer and introduced me into the comprehensive and imaginative and vigorous language of prayer. They convinced me that teaching people to pray was my best work. From Prince Caspian by C.S. Lewis in chapter 14: HOW ALL WERE VERY BUSY. She clutched at her desk to steady herself, and found that the desk was a rose-bush. She looked out of the window and saw the divine revellers singing up the street and a stab of joy went through her heart. Aslan stopped right under the window and looked up at her.